"ESCAPING THE SCORCHING HEAT IS PRACTICAL AND BEAUTIFUL"
We long for warmth and sunshine for many months of the year only to desire a shady retreat when the hot temperatures hit. You can have it both ways with some planning and patience. Creating some shade in your backyard for warm summer days necessitates both short- and long-term planning. John C. Young, the eponymous owner of a landscaping and design company in Delaware, specializing in custom-built outdoor living spaces and water gardens, says getting your focal point is the first step. He says it could be a water feature or swimming pool and from there you build your outdoor living area around it. For immediate shade around the water, he recommends a mobile covered awning that can be moved with the seasons. Young says a cabana will provide lasting protection from the sun and there are many styles and designs to choose from. He adds that if you’re planning long term, consider planting a sugar maple tree that can grow up to 35 metres tall. It will grace your yard with colour as the summer gives way to radiant fall. Boekestyn recommends cultivating hostas, brunnera and ferns, along with flowering perennials such as astilbe, woodland phlox and bleeding hearts that can withstand shade. If you prefer annuals, she suggests blue angel, begonias and fuchsias. The other plus with using pots is that they provide low-maintenance gardening. “You can move them in and out of shade and into the rain to get water, and you’re not battling weeds when you use pots,” she says. If you want immediate shade this summer, use an existing structure such as the side of a garage, and soften the area with foliage, chimes and a gazing ball to reflect some light, she suggests. When planning your outdoor space, Boekestyn says people sometimes forget to consider all the senses. Plants that do well in shade and have a lovely scent include lily-of-the-valley, phlox and the mock orange shrub. And of course, walking barefoot in the grass is a rite of summer and feels luxurious under foot. 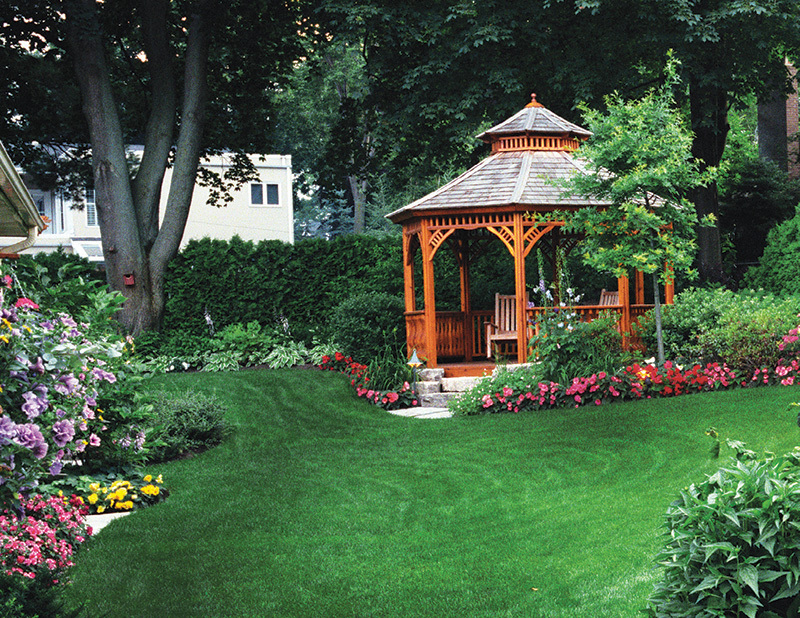 Young says above all when outdoors, enjoy it and take pleasure in the process of creating your backyard space.